Your club's first pick: Who's in the mix? "IT'S FINE – move on." 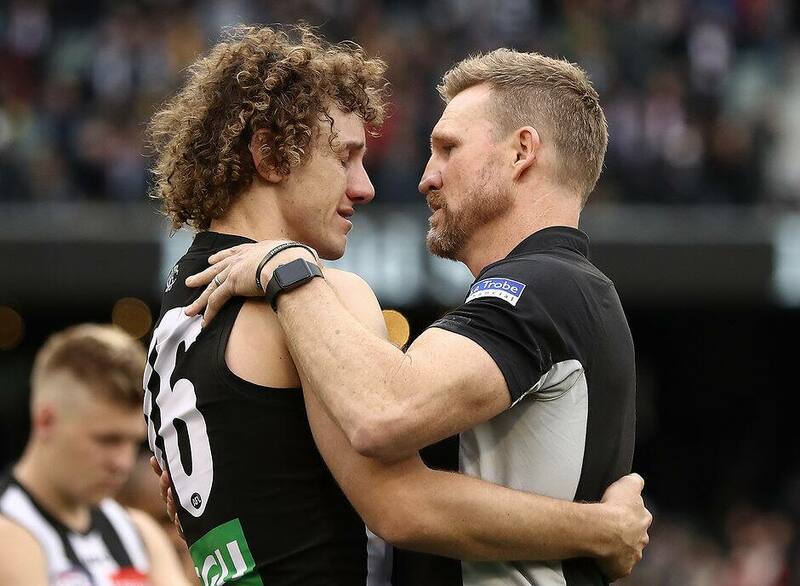 Nathan Buckley, minutes before this year's Grand Final, wrapped his arms around a disconsolate Collingwood cheer squad member coming to terms with a wind-obliterated banner. About three hours later, the seventh-year coach set aside his own disappointment about the Magpies' five-point defeat to be at it again. This time it was club runner Alex Woodward who was the recipient of Buckley's empathy. Woodward, as many would know, is a former AFL footballer who has undergone four knee reconstructions, so he's dealt with more than his share of devastation. Here he was in tears and blaming himself for the loss after accidentally blocking Jaidyn Stephenson's path and watching as an errant Taylor Adams kick instead found Eagle Elliot Yeo. Yeo went on to kick a goal after the third-quarter turnover, and Woodward was racked with guilt despite the unlikelihood of Stephenson impacting the play. Buckley gave him a hug post-match in the rooms, whispered some words of wisdom, then followed up with a few reassuring pats on the back. He became the face of 'new-age' AFL coaching in those two moments. AFL coaches' job description transformed as the industry slowly became full-time for players and staff from the mid-1990s. Michael Poulton, who specialises in coach development and previously worked for the AFL and several of its clubs, has watched the shift occur. "Coaches are now looking after young men's lives as a career, not just as 'I play footy after-hours'," Poulton told AFL.com.au. "Back in the day, coaches saw players for six hours a week before they played on the weekend, whereas now there's a duty of care to your employees in much more of a direct way than previously." One of the AFL's most famous Grand Final speeches belongs to Hawthorn's triple premiership coach John Kennedy snr in 1975, but would it have been as effective nowadays? "Don't think … don't hope. Do! At least you can come off and say, 'I did this' or 'I shepherded' or 'I played on' – at least I did something," Kennedy bellowed at his players that day. It was a different generation of footballers, where a spine-tingling rev-up such as Kennedy's sparked instinctual action, and it was a time of 'Anything the coach says goes'. Fast-forward to today, and players will ask various versions of: "Are you sure about that?" Coaches must adapt to be successful. "We've matured as an industry. The notion of, 'Do as I say and don't ever question it' and 'Don't think, just do' is not contemporary thinking," Poulton said. "People aren't striving to be their best when they're just being told, 'This is the way to do it, everyone does it that way and shut up and keep going'. "The big thing is around the understanding of yourself – and that does take time – and what impact do I have on other people?" Subtle changes like the simple act of coaches shaking the umpires' hand before games in last year's finals series was indicative of a new way of thinking that acknowledged others more. Damien Hardwick's Triple H sessions – hardship, highlight, hero – are credited as the centrepiece behind Richmond's extraordinary rise from long-time underachievers to 2017 premiers. What made them so impactful was that Hardwick bared his soul as much as the playing group, and so much so he revealed his wife told him he was not the same man she married. "I wasn't the happy-go-lucky bloke. I'd turned into something that was not what I wanted to be," Hardwick said. "It reflected poorly on me and my players, and I turned it around and embraced the vulnerability of being who I am. I haven't got all the answers." The V word – vulnerability – is important in this discussion, and relatedly saw Melbourne coach Simon Goodwin initiate 'growth sessions' at his club. Like Hardwick, it was the coach who set the tone, with Goodwin sharing some of his darkest moments, including his gambling addiction, family issues and, of course, the Essendon supplements saga. Over at Hawthorn, four-time premiership coach Alastair Clarkson is known for regularly whipping out his guitar for an impromptu sing-a-long with his players. Clarkson clearly rates himself as a bit of a crooner – something that gains a few laughs within the walls of Waverley Park – but that's not the point here. What he is doing is breaking down the barriers between coach and player for the greater good. There are examples of this practice all over the competition. Chris Fagan's bid to change what had become a losing culture at Brisbane was underpinned by positivity and trying to restore the players' self-esteem. Where this fits in with Fagan is that this behaviour is based on caring for others – and self – while maintaining "a grounded philosophy" that enables coaches to still make tough calls. "The Chris Fagan appointment is such an important one for the industry, because it says, 'In your mid-50s, you've got this incredible experience behind you and you've seen a lot of things'," Poulton said. "You go back to his days at Melbourne under Neale (Daniher). They were a club under siege and they came good. He was at Hawthorn in 2005, too, when things were going awfully. "He's won four premierships at Hawthorn, but he knows 'That's not the only thing' … you've got to invest in your people and understand your people and build that strength of relationship." Ross Lyon remains a polarising figure, but he, too, is fiercely loyal to his players, according to another coaching guru, David Wheadon. Zac Dawson and Harley Bennell, who Lyon took into his home for a period, are just two footballers who benefited from the Fremantle coach's support. "Ross is a very caring individual and the players love him," Wheadon told AFL.com.au. "He puts his guard up in the press, but Mick Malthouse and Denis Pagan were like that, too. You talk to the players and they'll tell you he backs them all the way, particularly when they're criticised by the press. "Ross demands excellence, but there's nothing wrong with that. Adam Simpson and Nathan Buckley demand excellence, too, but everyone does it differently." The endless quest for the premiership has the potential to leave just one of the 18 clubs satisfied and happy at the end of each season. Poulton said the game would be "pretty unfulfilling" for most footballers and coaches if that was their mindset, and other signs of success would be harder to see and benefit from. Enter the new-age, emotionally intelligent coach. "This is where the driven benevolence is so important," he said. "Think of a continuum where there's this cuddly coach at one end singing kumbaya and this hard-driven coach at the other end that cares only about winning premierships. "In between, there is a hell of a lot of grey area, and it's that grey area we need to spend more time in. You know what? You can be both things."